Rashi, the medieval French rabbi Shlomo Yitzchaki (1040–1105), authored monumental commentaries on the Hebrew Bible and the Babylonian Talmud. With The JPS Rashi Discussion Torah Commentary, his commentary on the Torah—regarded as the most authoritative of all Torah commentaries—is finally accessible to the entire Jewish community. 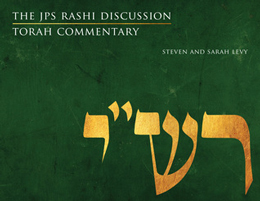 Steven and Sarah Levy quote from the biblical text in both Hebrew and English, highlight Rashi’s comments relating to the parashah, and delve into his perceptive moral messages in the context of twenty-first-century dilemmas. Each portion features three essays with analysis and discussion questions that draw on universal human experiences, enabling families and Shabbat study groups to deepen their understanding of Rashi and the portion over the three Sabbath meals. Readers with little or no knowledge of Hebrew, the Torah, or Jewish practice will feel comfortable diving into this discussion commentary. All Hebrew terms are defined, quoted verses contextualized, and less familiar Jewish concepts explained.